Despite several legal wins — including a ruling that the pipeline’s permit was illegally granted — state officials refused to enforce those rulings and they were eventually overturned. Arguments on the merits of the only remaining possibility to stop the pipeline through legal action are not expected to be heard until after pipeline construction is complete. As pleas for an evacuation route for the St. James community have continued to be ignored by elected officials and state agencies, water protectors have gradually increased their use of direct action, stopping work at multiple work sites across the route. “We’ve exhausted all other means to protect both the community of St. James and the Atchafalaya Basin, which is a designated natural heritage area,” said Cherri Foytlin, co-founder of the L’eau Est La Vie resistance camp. “The permitting agencies, the legal system, law enforcement and our public elected officials have failed the residents of Louisiana, but that doesn’t change the fact that the Bayou Bridge pipeline is bad for the people and environment of our state,” said Foytlin. “If the state can’t – or won’t – protect its residents from this destructive and greedy corporation, water protectors will. We will not stop until the residents of St. James are protected,” she added. 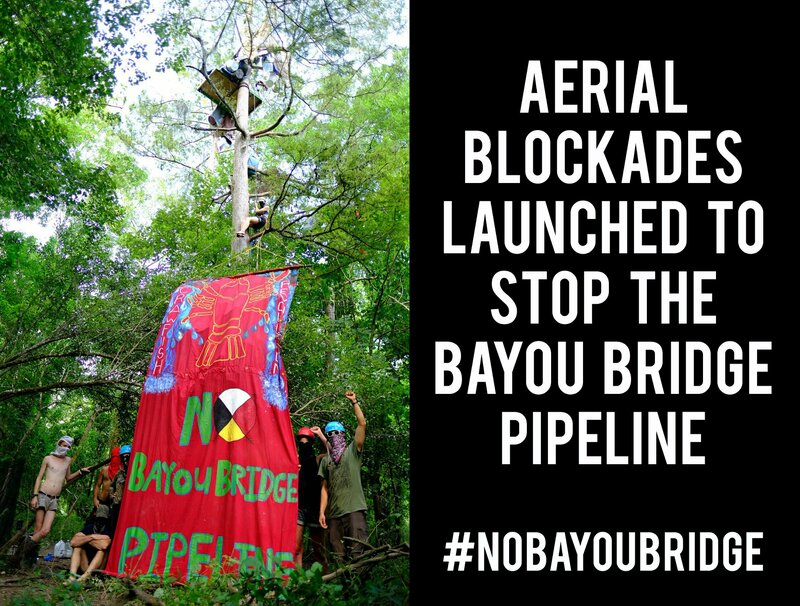 The Bayou Bridge pipeline is part of a larger Energy Transfer Partners crude oil pipeline project that will connect the controversial Dakota Access pipeline in North Dakota to oil export terminals in Louisiana. In 2016, tens of thousands of Native Americans water protectors and their allies gathered at Standing Rock to oppose the Dakota Access pipeline, which now runs under the Missouri River, where a spill could contaminate the primary source of drinking water for the Standing Rock Sioux and millions in the Midwest. Considered the southern leg of the Dakota Access pipeline, the Bayou Bridge pipeline has faced numerous lawsuits and fierce opposition among indigenous groups, environmental organizations, crawfisher associations, and communities in Cancer Alley. Water protectors cite Energy Transfer Partners’ atrocious human rights and environmental record as evidence that Bayou Bridge is an operator that can’t be trusted. A recent report found that ETP’s pipelines have spilled an average of once every eleven days for the past fifteen years. The report also found extensive violations of human rights and indigenous sovereignty committed by ETP during the construction of recent projects, including the highly controversial Dakota Access pipeline project, which has already leaked at least six times. “We deserve better than to have our precious resources pulverized for the profit of a private oil company based in Texas,” said another tree sitter who added that ETP has already stolen land through eminent domain, land that was stolen from indigenous people.